A head teacher is walking the length of Wales on stilts to raise money for a lung cancer charity. 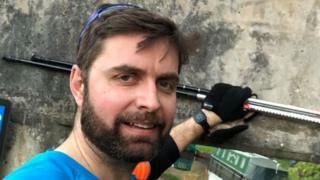 David Griffiths is walking a 255-mile route from Anglesey to Cardiff and plans to arrive before Wales take on England in the Six Nations on Saturday. Despite covering 20 miles a day to get to Cardiff, Mr Griffiths does not have a ticket for the rugby. "As long as I can get back to the pub to watch the game before it starts then that's fine," he said. The 41-year-old took on the challenge after his sister-in-law discovered she was terminally ill with the disease. "Lung cancer is one of those diseases that is stigmatised by smoking," he said. "So the whole point of my challenge is to raise the profile of the disease, and the fact that people who have never smoked get ill and sadly die from it every year," he told BBC Radio Wales. Mr Griffiths, who started the challenge in May and planned to do the walk for 12 days in total, has so far raised more than £2,000 of his £10,000 target for the Roy Castle Lung Cancer Foundation. He said that walking 60 to 70cm off the ground gives "a different perspective on the world". Reactions of people range from those have have pretended not to notice him, to those who have run out of their houses to donate. Mr Griffiths, who teaches at the Old Buckenham Hall school in Suffolk, said the challenge was "partly about trying to inspire some kids to try to do something that seems impossible, but actually they can do it". "If I can walk on stilts for 255 miles, then there's no doubt they can pass some exams," he added.